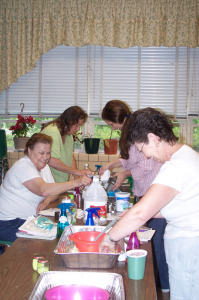 Friends of the North Fork helped attendees at our Home-made Cleaning Products Workshop make their own cleaning products. We have posted the recipes below so that you may duplicate these products in your own home. While these products are generally safe to use and safe for the river, please use at your own risk and keep all cleaning products away from young children and pets. Two teaspoons lemon juice may be substituted for lemon oil but then the product must be stored in the refrigerator. Shake well before using. Dip a clean, dry cloth into the polish and rub wood in the direction of the grain. Use a soft brush to work the polish into the corners or tight places. With finished furniture we always recommend testing a small patch on an out of site area first, just to be safe. Soap flakes can also be made by grating your favorite pure vegetable soap with a cheese grater. Mix ingredients together and store in a glass container. Use 1 tablespoon per load (2 for heavily soiled laundry). Wash in warm or cold water. This standard recipe can be adjusted for soft water by using 1 cup soap flakes, 1/4 cup washing soda and 1/2 cup borax. For hard water, use 1 cup soap flakes, 1 cup washing soda and 1 cup borax. Note: Borax should not be ingested. 1/2 cup 20% peroxide. Launder as usual. A quick and easy alternative to chemically-based sink cleaners. Mix and store in a covered glass jar. Sprinkle in sink, then use a sponge and hot water to scrub the sink and faucets clean. Rinse well so as not to leave a dry film (especially on the faucet). This scrub works well to cut grease. Mix equal parts of borax and washing soda, but increase the washing soda if your water is hard. Add 1 cup of white vinegar to the rinse compartment of your automatic dishwasher. Wash dishes as usual. Suggested uses: hard surfaces like countertops, kitchen floors, windows and mirrors. USE CAUTION ON GRANITE, the vinegar is acidic and may damage the surface. Tip #1: Warming in the microwave until barely hot will boost cleaning power for tough jobs. Only microwave in a glass container. Tip #2: Fill a glass jar with orange peels. Pour white vinegar over the peels — enough to cover them completely. Shake the jar every day for 3-4 weeks. After 3 weeks, the orange peels will have infused the vinegar and the resulting cleaning product will actually smell great, and do a great job. Hint: To remember to shake the jar, keep in next to something you’re sure to see every day.